Argon cat. 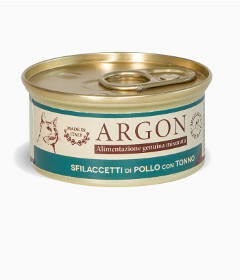 The quality and the taste of the made in Italy for the well-being of your cat. 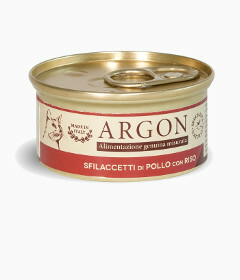 From the experience of Argon is born a complete and balanced nutritional proposal for feeding the cat. Selected ingredients, specific nutritional formulations and so many different flavors, to give the cat what more he needs to make him active, happy and healthy. Tasty chicken chunks with pieces of carrots, a mixture of natural ingredients to give the cat what more he needs to be happy, healthy and active. Tasty chicken chunks with rice, a mixture of natural ingredients to give the cat what more he needs to be happy, healthy and active. Tasty chicken chunks with tuna, a mixture of natural ingredients to give the cat what more he needs to be happy, healthy and active. Tasty chicken chunks with pork and pieces of olives, a mixture of natural ingredients to give the cat what more he needs to be happy, healthy and active. Tasty chicken chunks with salmon, a mixture of natural ingredients to give the cat what more he needs to be happy, healthy and active. Tasty pork chunks with rice, a mixture of natural ingredients to give the cat what more he needs to be happy, healthy and active. Tasty tuna chunks with salmon, a mixture of natural ingredients to give the cat what more he needs to be happy, healthy and active. Tasty tuna chunks with shrimps, a mixture of natural ingredients to give the cat what more he needs to be happy, healthy and active. Tasty turkey chunks with carrots, a mixture of natural ingredients to give the cat what more he needs to be happy, healthy and active. Tasty turkey chunks with tuna, a mixture of natural ingredients to give the cat what more he needs to be happy, healthy and active.